Put the egg white in the bowl of your electric mixer and whisk until stiff peaks form. Gradually add the sugar, whisking well, until the mixture is stiff and glossy. Add the vanilla paste or beans, and vinegar then whisk until just combined. Pipe or shape the mixture into an 16 cm round ring with a side of silicon paper, on a baking tray lined with non-stick baking paper. Reduce oven to 110°C and bake for 1 hour 15 minutes. Turn the oven off and allow the pavlova to cool completely in the oven. 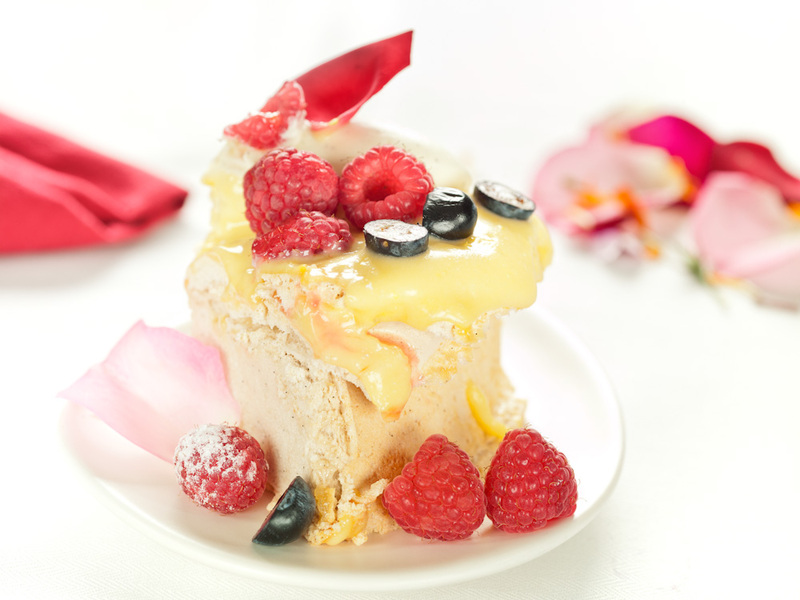 Pour the lemon curd (see separate recipe) over the cooled pavlova, top with fresh raspberries, berries, fresh herbs or flowers of your choice and serve immediately. Tip: Store your pavlova, undressed, in an airtight container at room temperature for up to 5 days.